The neighborhood's boxing scene is thriving, but gentrification threatens to take its toll. They start showing up at the gyms every afternoon around 5. During the summer, it’s still so hot even in the late afternoon that it doesn’t take much movement to have sweat dripping from the tip of your nose. And none of them—the youngest are 8 years old, the oldest in their early 20s—are here to sit still. Parents drop off some, others walk, and the kids stretch and warm up while waiting for coaches to arrive. Some coaches will be in their work clothes when they get there, their shirts ringed with dried sweat, circling from the chest to right below the shoulder and around the middle of the back. Casa Guanajuato and Vivero Boxing Gym are about a mile away from each other in the yet-to-be-gentrified part of Oak Cliff, west of I-35E, south of Jefferson Boulevard. They are authentic, old-school boxing gyms. Worn and musty punching bags hang among former boxers’ photos in cheap frames and newspaper clippings that have long turned brittle and yellow. Unlike franchise-owned gyms that only use boxing exercises for change-of-pace workouts, these places lack comfort. Blood and sweat have stained mirrors and floors. Countless rolls of duct tape keep the ring’s ropes and canvas from falling apart. The cliché is everyone here is fighting for a way out, that without boxing they’d end up dead or in jail. While that could be true for a few, most of these young boxers will never fight professionally. Some may not even fight in amateur tournaments. They’re here because, regardless of talent or aspirations, boxing has something to teach. Boxing—a sport that has increasingly become Latino and, because of that, gets mislabeled as dead—thrives here. For now, at least, while the gym owners can keep developers at bay. 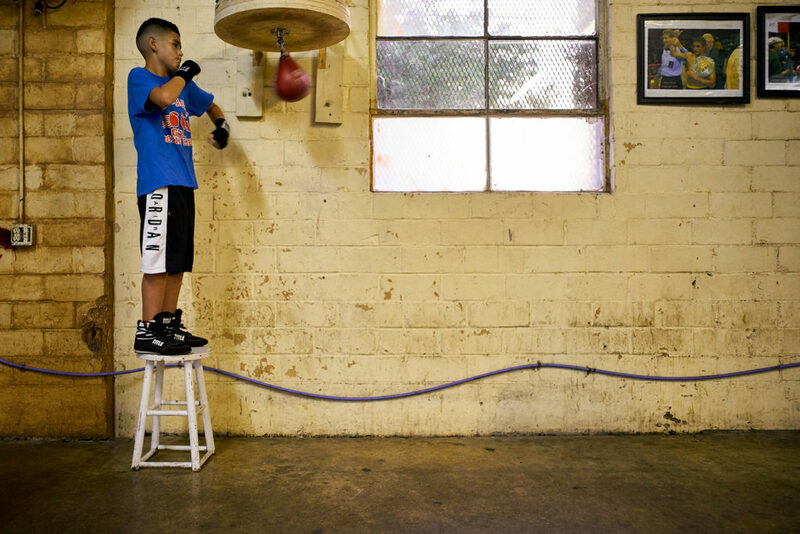 Step Up: At Casa Guanajuato, the height of the speed bag is no match for Angel Neyarez. Vivero is a no-nonsense type with a blunt tone that demands respect. Everyone who sets foot inside his gym must shake hands with those already there. “I want them to be respectful,” he says. Not even 15 minutes after stating his reason, a young boxer misses a hand to shake. “He don’t count, right?” Vivero, in his gruff voice, asks him. He repeats himself twice when the young boxer looks confused. “Shake his hand,” Vivero finally commands while pointing at who he missed. Shaking hands is a small gesture but a part of a larger discipline required in boxing. That discipline serves a greater purpose, both in and out of the gym. Vivero Boxing Gym is a converted automotive garage. If the three garage doors weren’t enough of a clue, below a white coat of paint you can still read the faint lettering of what the building once was. If the gym has air conditioning, you can’t feel it. When the gym is full, breathing feels heavy. It becomes so hot that stepping outside and into what used to feel like a fiery summer breeze instead feels like a relief. The gym is likely the most successful at producing talent within the Dallas area. “I’ve had more national champs and two Olympians come out of here—and Errol came out of here,” Vivero says with a quiet pride. The “Errol” that Vivero refers to is current IBF welterweight champion Errol Spence Jr., who is among the current top pound-for-pound boxers in the world. “A lot of Dallas’ [boxing] history is at that gym” is how Spence Jr. describes the many who’ve broken a sweat inside Vivero Boxing Gym. 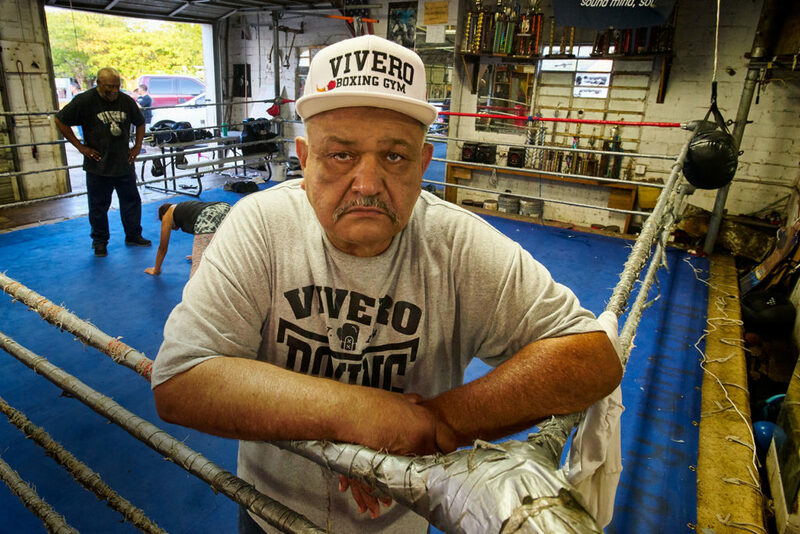 Tale of the Tape: Owner Gene Vivero takes a breather in a corner of his battered ring. Historically, most of the state’s boxing talent has come from Houston, San Antonio, Fort Worth, and a few areas in South Texas. But within the past decade, Dallas has risen on the boxing scene. As boxing has long been a sport practiced (and watched) by the lower and working classes, Dallas’ increasing economic and racial segregation are not completely unrelated to the rise of the city’s boxing prowess. Thus, as Vivero sees the change, there are now more boxing gyms and better coaching. Just in his small gym, there are six or seven coaches, depending on how you count them, since one of them is unofficial. That unofficial coach, tutored by the others, is a year away from being certified to teach the sport. He’s Erik Ramirez, a 17-year-old senior at Sunset High School. “It’s coming this way,” Gene Vivero responds when asked how he’s seen the area change in the 28 years that he’s owned the gym. It doesn’t need explanation. We all know what It means. At the amateur level—away from the bright lights of Las Vegas, New York, or anywhere else where professional boxing is firmly established, away from the valid criticism of the brutal sport—boxing plays a different role in the life of the sport’s young participants. With Erik and Figo, along with many others, boxing is family. If not literally, then it becomes a figurative one. 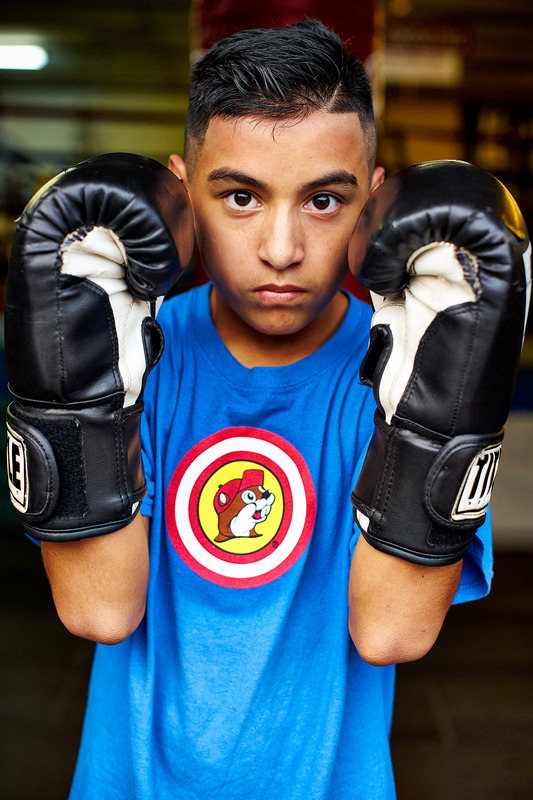 And in areas like Oak Cliff, boxing gyms play an important role in a community that faces socioeconomic change. If you drive through the residential streets of Oak Cliff, you can see this change in the many construction trucks parked in front of houses being remodeled and the dumpsters filled with the insides of those gutted houses. You can feel it, economically, with escalating rents and property values. You notice it in who lives there, and how that demographic is changing as new construction spreads. “It’s coming this way,” Vivero responds when asked how he’s seen the area change in the 28 years that he’s owned the gym. It doesn’t need explanation. We all know what it means. “You know at Wynnewood Shopping Center, they’re gonna sink $30 million into it,” Vivero says, almost incredulous at the amount that’ll be invested in a shopping area that counts Fallas Paredes and El Rancho Supermercado—both catering largely to the Latino population—among its major retailers. 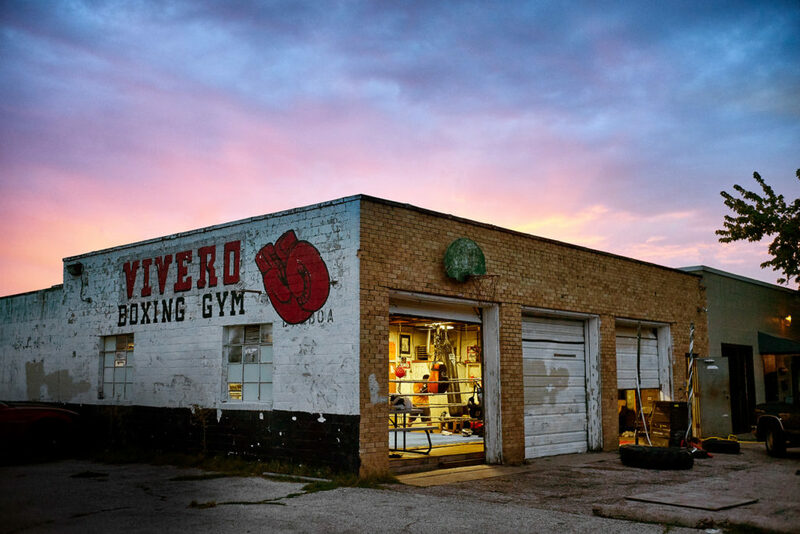 Champions are built here: Vivero is likely the most successful gym at producing boxing talent in the Dallas area, including current IBF welterweight champ Errol Spence Jr. The Bishop Arts district, for decades, was essentially abandoned, a cluster of forgotten, boarded-up shops. High school kids could hang out in alleys and on corners with no one bothering them. Now, of course, it is the epicenter of change in Oak Cliff. Signs are in English; just a few blocks south, they’re almost exclusively in Spanish. Commercial and apartment buildings are springing to life. Basic infrastructure—lighting and sewage among it—is being upgraded to the point that some streets are completely closed, at least for now. This section, to put it plainly, is whiter than the other areas around it. In fact, it seems like the only Spanish you hear comes from the construction workers. This is a different Oak Cliff, separate from what the rest of the area is now and what the neighborhood was historically. “Back in the day, when I was growing up, there was a lot of shootings,” says Freddy Narro, who grew up in Oak Cliff. “The gang violence was strong in the ’80s and the ’90s.” Narro—who works in construction, installing fire sprinklers—is now the head boxing coach at Casa Guanajuato, a community center that’s about a mile south of Bishop Arts and a block away from the abandoned Ice House Cultural Center. Narro has a friendly charisma. He’s prone to calling young boxers papá and mija. Individually, each boxer gets a nickname to help them form a sense of belonging. “It turns into a family,” Narro says of the relationships formed with everyone inside the gym. It’s a relationship that leaves him and his other coaches feeling guilty if, for whatever reason, they cannot teach on certain days. It wasn’t until his mid-20s, while living in North Dakota, that Narro got introduced to boxing. The move away from Oak Cliff was his mother’s decision, sending him there after he’d been locked up 13 times and experienced the death of a few friends and relatives, before he was even old enough to vote. Once he discovered boxing, Narro fell in love with it because, by his own admission, he liked to fight. “I was like, man, you don’t get in trouble? You get a trophy?” Narro laughs as he reminisces about the first time he stepped into a boxing gym. By any measure, Casa Guanajuato is one of the nicer boxing gyms you’ll find. Large, colorful murals—the Virgin of Guadalupe among them—cover entire walls. Besides boxing, Casa Guanajuato offers classes on citizenship, music, English, and job training. Tereso Ortiz founded the community center in 1994 and continues to run it. He’s received multiple awards and recognitions, from both the United States and Mexico, for his service to the community. Part of this service is celebrating cultural roots and traditions. But among the many programs the center offers, boxing is at the core. “Boxing, for me, has not only been the basis but even the maintenance of this place,” Ortiz tells me in Spanish, “and we’ve also had great success.” Among these successes is Luis Yáñez, a 2008 Olympian who has a mural dedicated to him in a corner of the gym. “Casa Guanajuato Boxing Gym La Casa de los Campeones”—home of the champions—the mural reads. Yáñez trained not just in Casa Guanajuato but also in Vivero Boxing Gym. Ortiz considers him part of the center’s community, one that’s evolved since Ortiz first arrived in Oak Cliff from Ocampo, Guanajuato. Latinos now account for about 40 percent of Dallas’ population. Oak Cliff, as a whole, remains among the city’s largest Latino areas. But as Ortiz notes, “If God gives me more years, I’ll be able to live through another enormous change.” Part of this change will not just affect the ethnic makeup of Oak Cliff but maybe even Casa Guanajuato’s location along with it. Developers have already offered a large amount of money for the community center. It is, potentially, life-altering money. “It’s incredible the amount of money that property is increasing here,” Ortiz tells me. His eyes are wide, brows raised, as if in disbelief that someone would offer so much for a place that cost him $85,000. Even after his sparring session at Casa Guanajuato, Acasio Zuniga, aka Bucky, still has the energy to put his dukes up. On a Thursday afternoon—an hour after someone’s turned on a Spanish-language radio station to echo throughout Casa Guanajuato, and after some of the young boxers have stretched and warmed up—it’s time to fight. A white thermostat says it’s 90 degrees inside the building. It’d be hotter if not for the two industrial-size air conditioners on full blast, losing their battle to keep the gym cool. Every coach differs on how often they spar their boxers. At Casa Guanajuato, they spar twice a week. At Vivero Boxing Gym, it’s every day. But regardless of how often they do it, all agree on its importance. Sparring is where heart and desire can overcome physical limitations. Conversely, it can leave even the most athletic and cocky kid crying, forcing him to abandon the gym when humiliated and never be seen again. “Sometimes, when they get tapped on the nose, they go play soccer,” is how Vivero describes these kids before he laughs softly. Sparring is where boxing’s greatest lessons take place. Past the handshakes and tough love, past the hugs and nicknames that make you feel like you belong, actual fighting is where one learns to get punched, knocked down, and, perhaps even more important, lose. This is why they fight. And why, when it’s time to do so, seemingly everyone at Casa Guanajuato stops what they’re doing and gathers around the ring. The rhythmic sounds of speed bags bouncing off fists and platforms stop. As do the grunting and guttural noises that go with any work on the heavy bags. Two fathers—previously talking to each other, while eating from a bag of generic brand chips and drinking soda from lime-colored cans—suddenly pay close attention to what’s about to go down. A girl around 10 years old—Chata, they call her—climbs into the ring and faces a boy around her same age. They touch oversize gloves, and in their protective headgear, they fight. If they’re afraid, they don’t much show it. They can’t. At this point, allowing themselves to get paralyzed by fear is beyond counterproductive. Chata punches and moves—bends at the knees, pivots off her back foot—with a fluidity that lets you know she’s been inside the ring before. As they fight, Narro stands about 4 feet away from them and teaches. “Create space,” he says. “Don’t get sloppy!” he yells. But, most important, he implores them to stay calm. “Dalé, Chata,”—Hit him, Chata—a parent yells. The round ends, marked by a piercing bell you can almost feel in your chest. One of the major rules—besides no cursing or taking off your shirt—says after each sparring session, the opponents hug. Without being told, Chata and the boy hug while Narro embraces them both. He congratulates them on a job well done and tells them he’s proud. He then takes off his glasses, uses his shirt to wipe off his sweat, and, squinting, looks around at all the young boxers standing by the ring. Pato, Frijolito, Joker, El Crusher, Chato (Chata’s brother), and many others stand and wait. Narro puts on his glasses and points at a kid. “You ready?” he asks. The boxer, about 16, already with headgear on—which covers most of his face, leaving visible just his dark-brown eyes—nods. “Órale,” Narro responds. “Get in here.” The bell rings and he fights. A visitor from the Vivero Boxing Gym, Aubrey Muniz (in pink), spars against Israel Garza, aka Fat Boy, at Casa Guanajuato. With each new building that’s erected, each previously dilapidated home that’s remodeled, each person who moves in and immediately thinks he knows what’s best for the community, and each business tenant who can no longer afford the rent, it has become increasingly clear that many of these kids and their families will also be forced to move from Oak Cliff. If not now, then soon. Progress is what developers call it. Others call it gentrification. Regardless of semantics, rising property values will increase taxes. For the many who rent, those taxes will increase what they pay for housing. For the few who own, the money being offered may be too much to turn down. 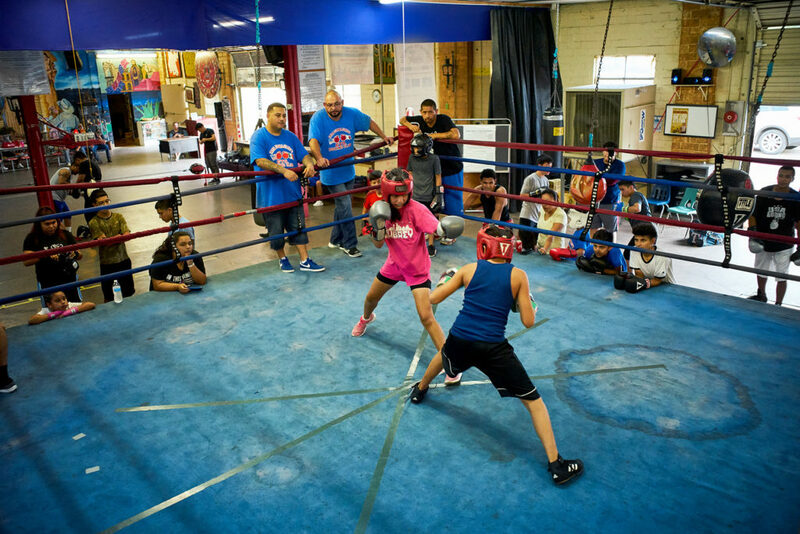 When that happens—for the same reason these types of gyms don’t exist in places like the Park Cities or Preston Hollow—Casa Guanajuato and Vivero Boxing Gym will get knocked down. They’ll get destroyed along with the area’s other boxing gyms, like the 10th Street Boxing Gym, which sort of forms a triangle with the other two. When that happens, Vivero and Ortiz both say, they’ll rebuild. Their coaches—young Erik, redeemed Narro—and the others will follow. So, too, will the boxers. All will arrive at a yet-to-be-determined place. It’ll be the type of place, not too dissimilar from the one they’re at now, where boxing—rather than being considered a dead sport by middle- and upper-class sensibilities—helps keep the largely Latino communities alive. It’ll thrive there and continue to do so, long after the time comes for them to move again.